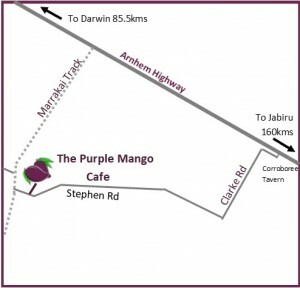 Travel south from Darwin along Stuart Highway. Turn left on to Arnhem Highway at the Humpty Doo turnoff. Travel for 36kms and cross the Adelaide River (Jumping Crocodiles – not township). Travel for approx. 15 mins then turn right into Marrakai Track (dirt road) for 2.7kms and turn left into Stephen Road. You will see the cafe entrance at the first driveway on the left. Once you arrive at the Marrakai Track, this map should help you find us. If you wish to travel on a sealed road then follow the southern route.